A lot of people I know make quilts. I am always impressed at the patience, precision, and stick-to-it -iveness it takes to finish one--not to mention talent. My sister and I grew up using handmade quilts, which our grandmothers made, as bedspreads. I can't speak for Sis, but I yearned for a ruffly chintz bed covering like the ones my friends had. My quilt was made by my mother's mother from outgrown-clothing scraps; my sister's quilt (actually, there were two matching quilts for twin beds in her room) were made from new fabric by our father's mother. Those quilts look more professional with a beautifully designed color-scheme and design. My quilt looked a little bit unbalanced because of the variety of fabric, but I loved it when Mother fondly recalled the clothing she had worn, scraps of which had become flower petals in my bedspread. Still, I thought I'd rather have chintz. It wasn't until years later that I came to appreciate the craftsmanship that had gone into the quilts my Grandmother Elmendorf made. Although the tiny pieces of fabric were sewn with a Singer Sewing machine, which was cranked by one hand while pushing the fabric through the machine with the other (note: this non-electric machine was pre-foot treadle), each quilting stitch was hand done! Now I am in absolute awe. None of that "take it to the quilter who will use a machine to overlay stitching in a specific pattern" that most quilters do now. My grandmother did the beautiful quilting stitch by hand! My daughter now displays this "old bedspread" on the wall in her guestroom, which she refers to as "The Elmendorf Room" because of the quilt's dominance as decor. Enjoy the pictures. They speak for themselves. First, let's be clear: I am not a football fan. The game, especially as it is played by professionals, is far too violent for me--cowardly wuss that I am. I cringe seeing the routine bodily collisions that bring football die-hards to their feet in roaring approval. All I can think of when I see those collisions is how the teammates' mothers must feel as they watch their precious "little boys" subject themselves to such intentional harm. But--and this is an embarrassment to admit--when the hometown team is "The Champion" and Seattlites everywhere are flying their "Twelfth Man" flags--and retailers are putting up huge displays of wares in Seahawk colors-- and total strangers on the trail near my house yell "Go Hawks", it's contagious. Yes, I have caught a mild case of the fever. Hopefully, I will be cured forever after February 2. 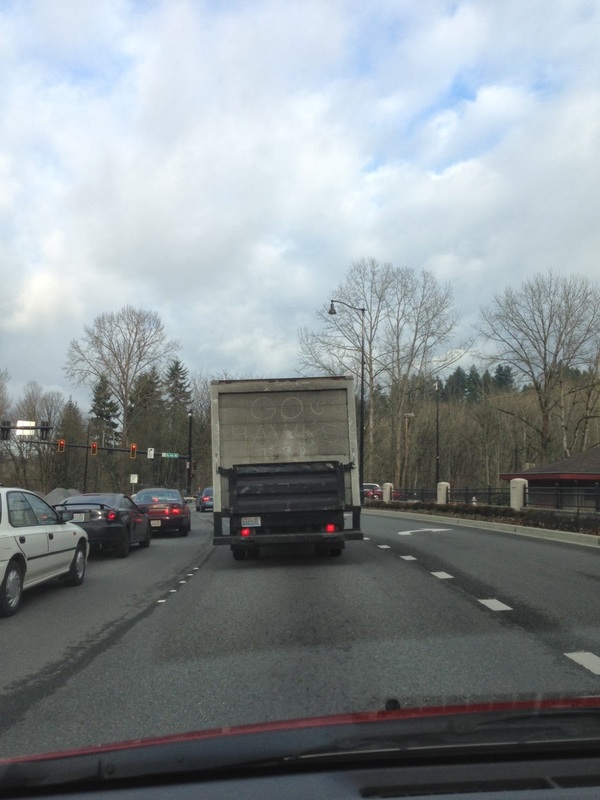 Tonight as I drove home from a haircut, I stopped at a traffic light behind a truck. Then I saw what you see here. 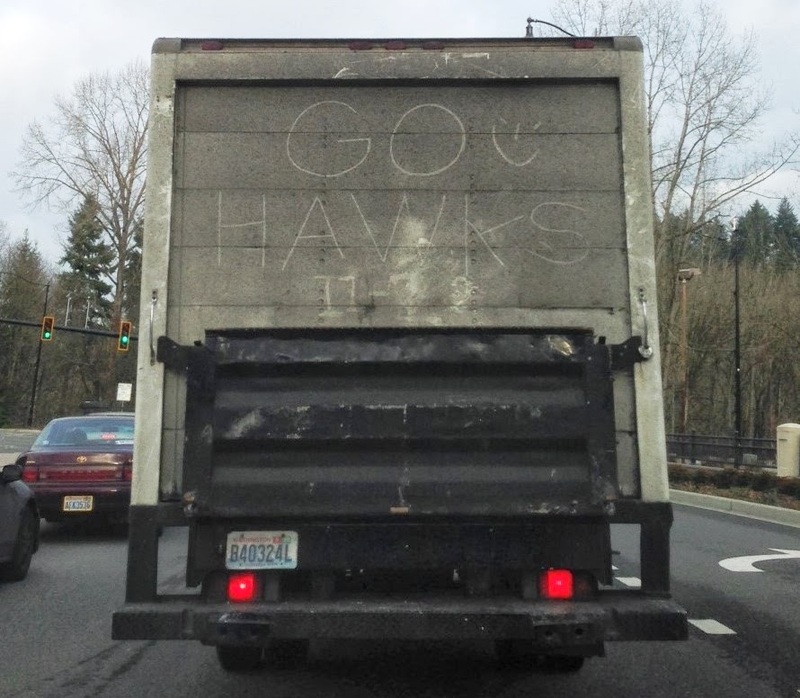 . . such neat, tidy lettering proclaiming what has become Seattle's slogan. I snapped the picture just as the light turned green. It’s fitting to begin 2014 with a short post about a bicycle, since I ended 2013 with a short post about a bicycle. December’s post was about ending an era—our final goodbye to an old bike belonging to our firstborn child. Somehow we kept the bike for forty years, thinking—always—that it would be ridden again and as appreciated as it was back in 1974 when it was a thrilling birthday gift for an eleven year old girl. We finally got wise and released the bike from the throes of sentimentality. January’s post is about beginning a new way of living for someone we’ve never met through the donation of a Buffalo bicycle in our name. 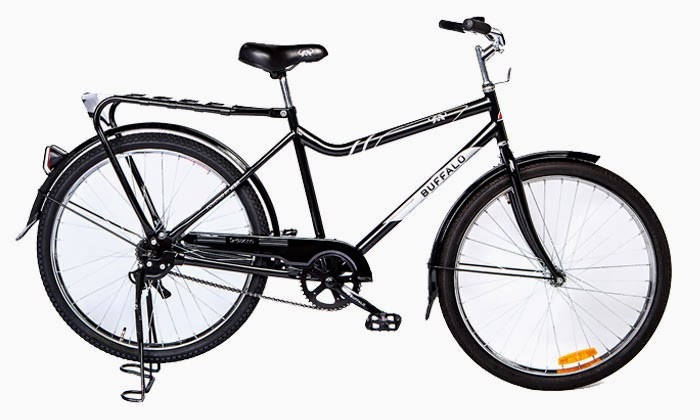 The group that gives away these sturdy, dependable bikes is called World Bicycle Relief—USA, and you can read about it by clicking above on the italicized name of the organization. We were delighted to learn that, instead of sending cookies, fruit-of-the-month, or other lovely but dispensable Christmas gifts, our donor sent the gift of enterprise to an unknown person halfway around the world in our honor. That is not to say, of course, that we didn’t greatly enjoy our tangible gifts that arrived over the holidays from friends and family. We loved everything we received (especially the handmade eyeglass cases and handkerchiefs from a certain seven-year-old). But World Bicycle Relief has a concept that deserves support and recognition, so I'm doing my bit by mentioning its good work here.